Come along to the amazing Funkya@Unkya Christmas market and stock up on some unique presents! There will be free Christmas craft activities for the kids, great coffee and yummy cakes, bacon and egg rolls and the amazing music of Rory Ellis. Eungai Creek is just off the Pacific Highway approx. 15km south of Macksville, 35km north of Kempsey. The Nambucca Valley is a perfect choice to discover more. On top of all the attractions of a pristine coastal location, the Nambucca Valley offers an amazing range of activities and tours. Immerse yourself in the history of the river and local towns, experience the diverse artistic culture and visit the many museums, galleries and markets. 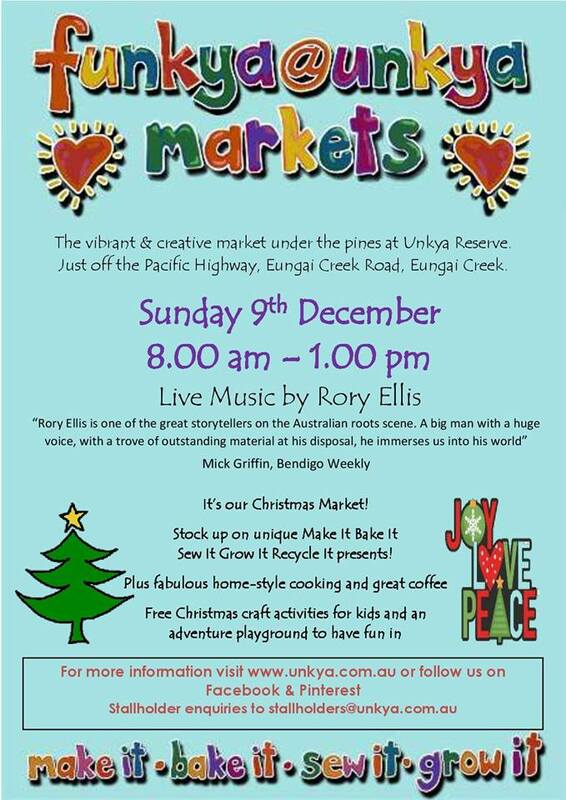 Want to stay up to date with all the happenings at the Funkya@Unkya markets? Enter your email address below to sign up to receive our regular email newsletter. PS: We won't give your email to anyone else. Unkya Reserve Committee of Management.